Zara Davis and fellow Simmer team rider Kevin Greenslade took first places at the UK speed championships which was a counting round of the ISWC world tour. These wins ensure Zara stays on top of the women’s ranking of the ISWC and puts Kevin up the ranking at his 1st speed event. The UKWA Speed Championships take place under the umbrella of the Dakine Weymouth Speed week and this year was a great success with racing every day. The event is extremely popular with over 120 people taking part. 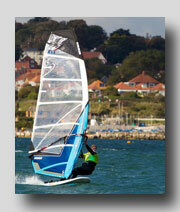 Dakine Weymouth Speed Week is held in October to try and make the most of the prevailing SW winds. Unfortunately the winds were mainly moderate from the North this year which made Speed sailing tough in the harbour. This did not stop the competitors achieving some very high speeds in many cases over twice wind speed. Kevin and Zara were the victors on the windiest day, Tuesday in 16 to 18 knots of wind, Kevin was hitting over 34 knots and averaging 32.75 knots over the 500 metre course. The Winds were moderate for a speed event at 18 knots average (but the round counted as over 25% of the fleet went over 28 knots). The big change this year was a move to using GT31's, GPS devices and GPS Results software to time and analyze the competitors. This enables the organisers to capture every run and give extremely accurate speeds of the riders. Pete one of the organisers said " Great event and the new timing system gives us so much more flexibility on course's and angles when the UK weather doesn't do what its meant to, and most importantly we get everyone's run no matter how slow of fast, it is a major improvement"
Zara’s comment after the days racing was “The sails made the speed a lot easier to maintain in the choppy water and light winds as the forward pull of the 2010 race sails just keeps you planning through the lulls and chop this combined with my new Sonntag fins and Mistral boards meant I made the most of the wind we had ”.